What is worthy about Tomorrowland is that it starts out as a typical young-adult exceptionalism fantasy, draws in a few action scenes, an unusual blend of futurist and quasi-steampunk elements, and a standard vision of a technocratic utopia, then gets around to critiquing all that. 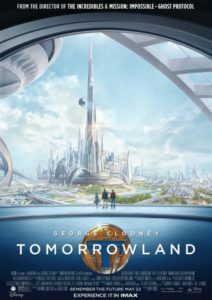 Basically, the premise is that around the turn of the nineteenth century a group of scientists created a utopian society called “Tomorrowland” in another dimension, freed from all the bureaucracy of the “real world.” Frank Walker (George Clooney) lived there as a child, but was exiled and now lives as a recluse on Earth. A robot friend of his Athena () then recruits a teenage girl (Britt Robertson) to help him get back to Tomorrowland and fix the thing he built that led to his exile. But, what is most intriguing are two things. First, when the trio does arrive in Tomorrowland, they discover that the problem is not really about science and engineering (by “fixing” the device that Walker had built), but about politics, and dislodging the essentially corrupt leader in Tomorrowland David Nix (Hugh Laurie) who knew all along — unlike Walker (?) — how the device was destroying Earth. Basically, the trio realize that people are stupid, but, unlike Laurie’s character, don’t feel that widespread human stupidity justifies allowing the destruction of humanity on Earth. And in that process, they basically stage a violent coup — though the film does not explicitly emphasize this aspect of political revolution, it does happen. Then, with the old regime toppled, Walker sets up a program to recruit new people to Tomorrowland, and in a speech he acknowledges that toppling the old regime was the easy part and what comes next, actually building a better utopia, is the hard part. While the film shows this next phase in a very cursory way, and avoids the sort of difficult theoretical aspects of describing how that hard work should proceed, it at least realistically suggests where the hard work must take place. This is a film for young people, and is rather light entertainment, but at the same time the film’s message is a good one (basically Leninist).